Boys volleyball have spiked their way to the top, placing them in first in league after defeating the Bernstein Dragons in Wednesday’s home game 26-24, 26-4 and 25-21. The Sheiks showed their hard work by winning the title Central League Champions for two years in a row. On Apr. 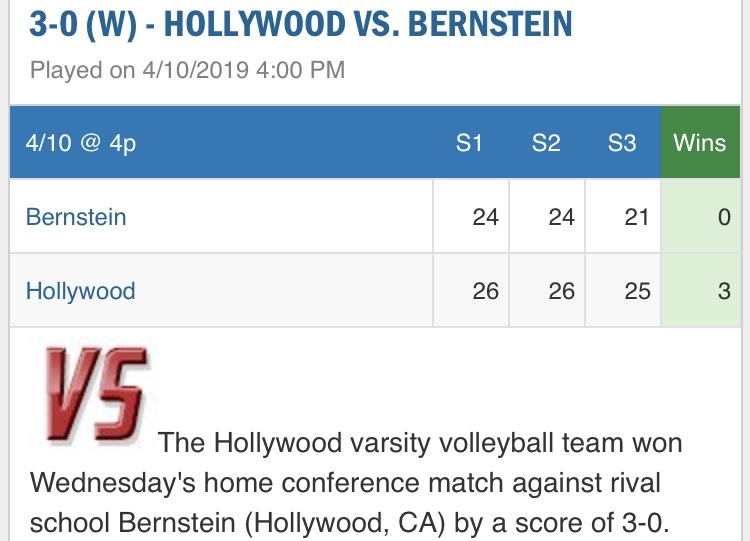 10, Hollywood fought in their last season game against Bernstein which proved to be the match of the season. Taking vengeance for the 3-1 loss on Mar. 18, the Sheiks slayed the Dragons in three sets. The sets were tight. Passing the traditional ‘25’ marker, both the first and the second set went up to 26-24 in favor of Hollywood. The last set was less stressful for Hollywood, winning 25-21 as the Dragon momentum went down. This was the last home game of league, which means that it was senior night for the Sheiks. Celebrating the seasons of Julian Berzonetti, Matthew Gudiel, Korey Valentine, and Ethan Kong. Gift bags were handed out to both Hollywood and Bernstein seniors in between the JV and varsity sets.